"As New Services Track Habits, the E-Books Are Reading You." While some view this as creepy, it offers powerful benefits that are yet to fully emerge. Wouldn't it be good to pay for books depending on how you read them? This recent NYTimes article by David Streitfeld highlights the instrumentation behind e-books and other digital media, and how distributors, publishers, and authors can use it to better understand their markets. People are talking about how Big Data enables "The Quantified Self" -- think of this aspect as "Quantified Media." 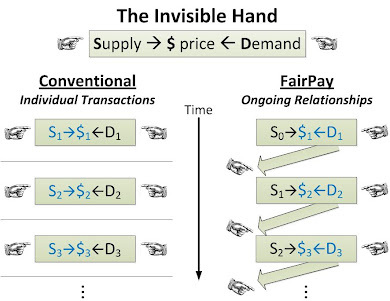 With the FairPay pricing model, this gains far greater potential -- and clear benefit to the reader. How much you have to pay for a book can depend on how you read it -- how much, how long, how deeply, how repetitively. That data is indicative of the value you receive from the book. Why should what you pay to read it not depend on how you read it? Start a chapter or two and quit, and pay nothing -- just like a Kindle free sample. Skim the whole book in 15 minutes and pay little or nothing -- much like Amazon's "Look Inside." Read a novel all the way through and pay a normal price. Read it three times and pay a bit extra. Study a how-to book, highlight sections, and go back regularly over many months, and pay accordingly (but with a volume discount). Use six travel guides on four countries during a one-week cruise and pay the equivalent of buying one travel guide (a detailed example is in this older post). On Oyster, once a person reads more than 10 percent of the book, it is officially considered “read.” Oyster then has to pay the publisher a standard wholesale fee. With Scribd, it is more complicated. If the reader reads more than 10 percent but less than 50 percent, it counts for a tenth of a sale. Above 50 percent, it is a full sale. Distributors collaborating with publishers instead of being at odds with them? What a thought! Of course that can lead to win-win pricing models. 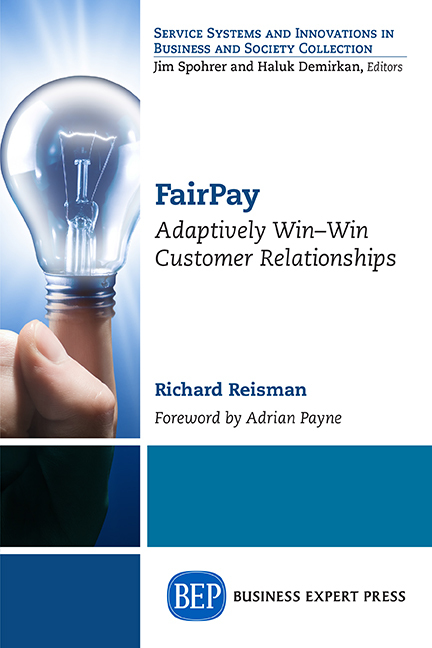 With FairPay, a similar win-win collaboration involves the reader as well. 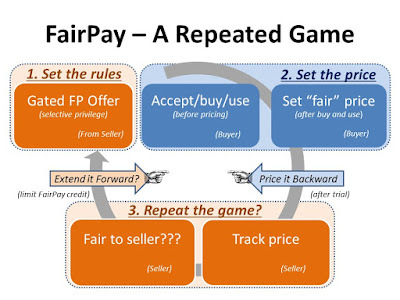 FairPay lets readers pay whatever they think is fair for books, based on how they read them. If the distributor agrees that is fair (including consideration of any explanations offered) their subscription or buying privileges are continued (but in any case the buyer's price is final for the current transaction). This removes the barrier of price from reading a book. It invites anyone with an interest to try a book, and only pay to the extent that they feel they got value from it. It allows those on limited budgets to apply discounts, and business readers to be expected to pay more, having derived greater value. It also strenghtens the bond between the reader and author, where readers feel an obligation to pay to authors who give them a valuable reading experience (especially if they know a fair share goes to the author). It also strengthens the bond between the reader and a publisher/distributor who gives them the kind of e-books they value, and supports authors they value.